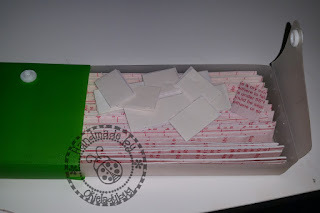 One of the things I love to use when papercrafting is Pop Dots but I don't actually use Pop Dots because they are a bit expensive in my opinion when used in volume that I use them. They are especially expensive if you have to buy several different packages in order to get the size you want and my solution is to make my own then cut to the size I want. To make it even better I can layer it to get different heights. I started to panic last night while finishing up decorating my last box and I thought I was getting low on my own Pop Dots. 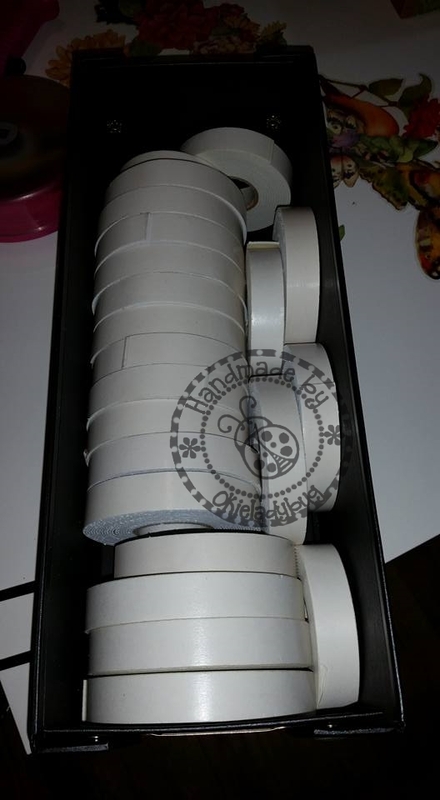 Fortunately when I went to the closet in the craftroom and checked my box I was quite relieved to find that I still have a "few" rolls of mounting foam. I stocked up a few years ago when Wall's Bargain Center had quite a few packages for $1 each and I think there were like 3 or 4 rolls to a package. I shared my find with my friends Linda and Carmen. So what do you need to make your own Pop Dots? Mounting Foam and something to stick it to, yep that's it! What I have found that works great is the left over sheeting from contact paper. I have tried several things over the years but this works the best because it releases the mounting foam the best. I use to just cut pieces off the rolls but my scissors would get gummed up pretty fast and after going through a few pairs I would have to clean them with some Undu because they wouldn't even open anymore. Since I store my mounting foam strips in a pencil case I cut a piece of contact paper the length of the pencil case to make things easier. 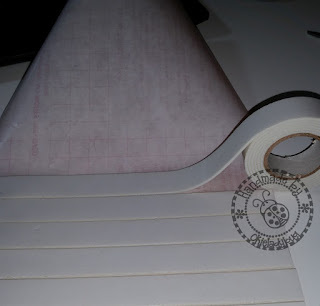 I then lay out strips of the foam covering the piece of contact paper backing making sure to leave a little gap between the strips so I can cut them apart when I'm done. 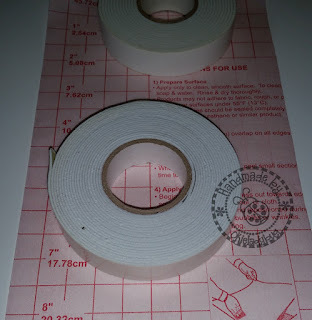 My pencil case will hold two rolls of mounting foam strips and this should last me awhile. The case fits nicely in one of my craft table drawers and is handy to get to. I love being able to cut the size I need without getting my scissors all gummed up. After spending about 20 minutes doing this last night I'm all ready for when I need Pop Dots! Thanks for sharing, such great advice! Thank you so much for the tip ! I love the way you store them. That would keep them from getting caught on everything else in my adhesive drawer like they like to do. I'll have to do this. Thank you !! This is the most amazing craft tip EVER! I tried it out last night, and it works fantastic. You have changed the way I craft forever! LOL Thanks so much for sharing. Love this idea!! I will copy!! Miss you Okie!! Hope you are OK!